I’m hooked on Amish Suspense! The first book I read in the genre was Linda Castillo’s Sworn to Silence. The contrast between the God-fearing and peace-loving Amish and the evil villains drew me into the story and kept me turning page after page after page. At the time, I was writing my Military Investigations series and decided to introduce an Amish thread into my next book. TheAgent’s Secret Past released in March 2014 and had a CID agent heroine who had been raised Amish. She left the community, eventually joined the military and went into the Army’s Criminal Investigation Division. But her Amish past follows her, including a man who seeks to do her harm. Adding the Amish twist was a refreshing change of pace, and the story went on to win the Daphne du Maurier Award of Excellence for Inspirational Romantic Suspense. After writing a few more military stories with an Amish connection, I pitched a straight Amish suspense series to my wonderful editor, Emily Rodmell. Emily liked the ideas I presented and offered me a four-book contract. My Amish Protectors series features three sisters who are caught in a human trafficking racket in the North Georgia mountains, near the fictional town of Willkommen with its surrounding Amish community. Each heroine relies on her own Amish or soon-to-become Amish hero to keep her safe. 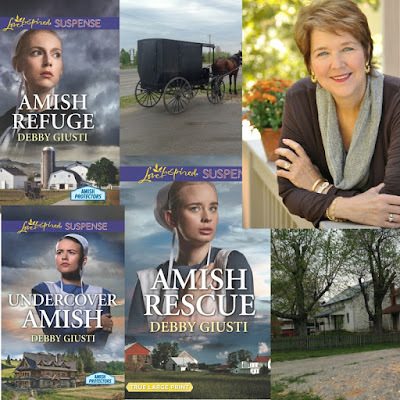 Amish Refuge, book 1, and Undercover Amish, book 2, hit Publishers Weekly Bestsellers Lists and have been well-received by my wonderful readers, for which I’m so grateful. In April, book 3, Amish Rescue, will be in stores and available through Amazon and other online merchants. The fourth book in the series, Amish Christmas Secrets features a secondary character from book 3 and will be out in October. Writing Amish suspense takes me into another world. I leave electricity and technology and creature comforts behind and travel by buggy to an Old Order Amish home that exudes peace and tranquility with its simplicity, sparse furnishings and lack of indoor plumbing. I stoke the wood-burning stove, pull homemade biscuits from the oven, and pour coffee from an aluminum drip-pot that warms on the back of the stove. The rich aroma of an apple pie cooling on the sideboard fills the air as I snap beans and slice fresh tomatoes from the garden. I discard my jeans, T-shirt and fleece and instead wear a blue, calf-length dress and white apron. My hair, pulled into a bun, is covered with a prayer kapp as I interact with my characters, sans makeup and jewelry. Phones, including cell phones, are verboten. Forbidden. So are computers. Some Amish businesses have computers or phones in their shops, but phones and power lines and technology—anything that would undermine or pull apart family unity—are not allowed within the home. My characters don’t text or send emails or share information from a home phone. They can, however, use pay phones. They also correspond by mail, and as within any Amish community, news travels quickly by word of mouth. In my current work in progress, a neighbor has a phone shack on the edge of his property. The shack looks somewhat like an outhouse, but instead of a toilet, it contains a phone and answering machine, powered by solar panels. In real life, the phones are primarily used for business dealings and the answering machines for incoming orders from customers. The phones can also be used in case of emergency, such as if an ambulance needs to be summoned. Englisch heroes and heroines often carry weapons—Glocks and Sig Sauers--when they’re running for their lives or caught in a villain’s crosshairs. But the Amish are pacifists and don’t believe in violence so self-defense can be a problem in Amish suspense. The characters must have a strong motivation before they raise a hand against another. Even then, it’s probably not what a true Amish person, especially those who are Old Order, would do. But In my books, the heroes protect the women and children. I’ve used hunting rifles, guard dogs, and forces of nature to deter or stop the bad guys. Kitchen knives and farm equipment can cause harm as well. The Amish are allowed to ride in cars, they just can’t drive or own them. They can travel by bus and train, but horse-drawn buggies are their main means of transportation for distances of about fifteen miles or less. For longer trips, they rely on Englisch friends and neighbors with cars or hire taxis to drive them from one place to another. Charter buses transport Amish tourists to vacation destinations, usually in the winter months when the fields lay fallow. A favorite holiday spot is Pinecraft, Florida, an Amish and Mennonite enclave within the city limits of Sarasota. When the buses arrive, a crowd gathers to welcome the new vacationers. In Amish Christmas Secrets, my heroine rides her bike to town, which is another source of transportation used by many Amish folks and one that’s particularly popular in Pinecraft. My heroine also rides horseback as she did in her youth. Of course, she slips on a pair of sweat pants under her long skirt so she can climb into the saddle and still maintain her modesty. Share your ideas about how writers can work around the Ordnung rules on transportation, self-defense and communication in Amish suspense stories. Mention other areas that could be a challenge when writing Amish suspense. Leave a comment to be included in a drawing for an advance copy of Amish Rescue, the third book in my Amish Protectors series. What’s coming in the future? 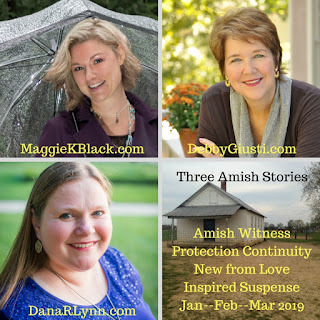 Maggie Black, Dana R. Lynn and I were asked to each write one of the books in an upcoming Amish Suspense Continuity, published by Love Inspired Suspense. We’re excited about the stories that feature heroes and heroines who enter the Witness Security Program and are hidden within Amish communities. Titles are pending, but the first book, by Maggie Black, will release in January 2019. My story—book 2—follows in February and Dana ends the series with book 3 in March. We’re having fun crafting the stories and promise more information in the months ahead. Be assured that each of the books will be fast paced and filled with the exciting danger found in every Love Inspired Suspense. The coffee is brewed and hot tea is available. Pour a cup of your favorite beverage and enjoy an Amish breakfast of eggs and country ham, fresh baked biscuits with apple butter and pancakes with warm maple syrup. Enjoy! Congratulations on your continuity, Debby. Well deserved. Thanks, Tina! Hope all is well with you. Great post, Debby! Has it really been four years since the release of The Agent's Secret Past...wow. Congratulations on the new continuity series! Debby! I'm so excited to hear about the continuity... what a great idea, and three marvelous authors taking part. Congratulations! My wonderful editor, Emily Rodmell, came up with the idea. She's amazing and always thinking of new ways to interact with readers. She is amazing.... We've got a great staff in New York City, probably getting snowed in right now! You're right, Ruthy. Emily is amazing! I'm sure you're getting snow too. So many storms in the NE this year. Stay warm and stay inside! Debby, I can see threading romance and suspense and faith... what you and Dana do so artfully is adding the constraints of the Amish lifestyle and beliefs while keeping the story believable and appealing to the reader... You make it make sense, and that's a tightrope to walk when you're talking heroes and heroines, etc. So well done, and thank you for being so plainspoken (yes, laughing!) about this. Wonderful post, riveting stories and marvelous author. Good morning, Debby! 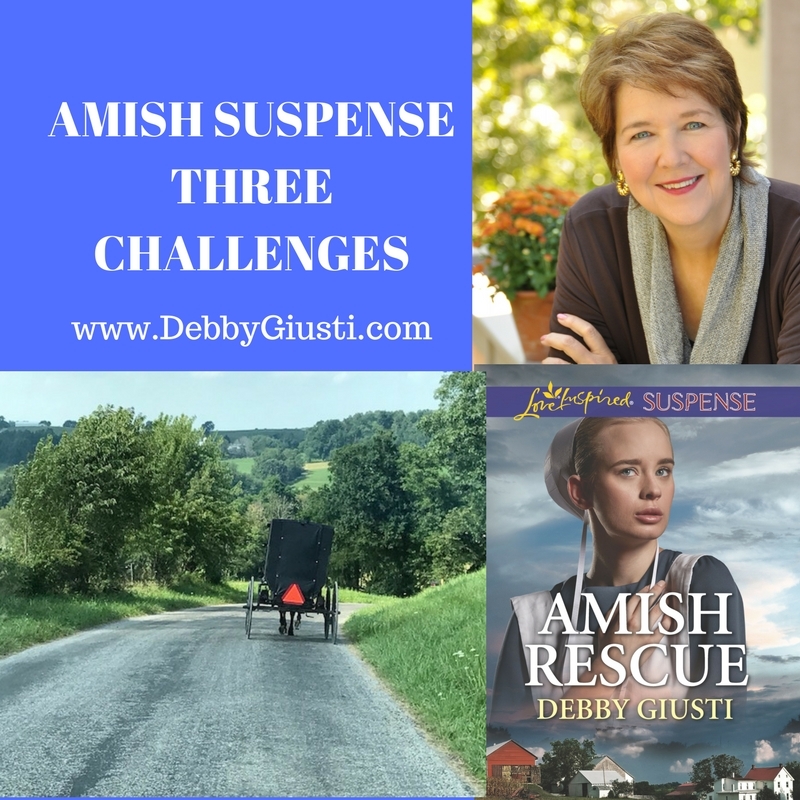 There certainly are challenges to writing suspense in an Amish setting! But you do it SO well. Congrats on the continuity series!! Glynna, thank you! You're so sweet...always! Have a great day! P.S. I always LOVE seeing your photos of Amish country--reminds me of growing up in the rural Midwest. :) In both Missouri and Iowa Amish buggies were a common sight near the towns I lived in. I love seeing the buggies and hearing the clip-clop of the horses's hooves. Be still my heart!!! Debby, good points and good post. I do neither Amish nor suspense, but I imagine the constraints are similar to writing historicals. Obviously there weren't telephones on the Oregon Trail, or much of anything else. I had to research the use of things such as the safety match (it had been invented, but just barely). I also faced the challenge in my Post World War I story. There were cars and there were telephones, but not everybody had them. It must be harder in a contemporary, because everyone has them EXCEPT the Amish. I feel no leading to write Amish but would like to try suspense and mystery at some point, when I've really mastered structure and plotting. This month I'm working on editing and rewriting, in three different series. Has to be done, but I'm looking forward to a point where I can write, create and get to know a whole group of characters. I still use your Easy Editing Tips. Going off for a Winter Weekend Friday, and plan to use them to sharpen what I'm working on. Do you find yourself totally enveloped within that historical period when you write your stories? I was truthful about how I step into the Amish world so easily these days. Of course, at first I have to "see" my story. Once I understand the characters and have an idea of the story line, then I'm ready to move into my Amish persona. My hubby and father and son were all military so writing that series came naturally. Perhaps that's why I didn't notice moving into the military setting because I was already at home within the military world. I have a feeling sci-fi and fantasy writers feel the same about the worlds they create. Congrats on your success, KB! So excited for you! You sound busy! Good luck with your projects. I wanted to reply here because of your mention of The Oregon Trail. I just finished writing a short (short!) story set on The Trail for Christian flash fiction magazine Spark and I really loved researching it. As a Brit I didn't know much at all going in. Um, we have wagon wheel-inspired biscuits... I loved doing the research. Not tried anything other than Scottish before. And the stuff you can get online is amazing., eg full names of people who travelled with particular trains and where the came from. I've read LI Amish novels but I haven't read any Amish suspense yet. Now I'm intrigued as to how you deal with these challenges... I'm working on finishing my Love Inspired #AmishBlitz project atm and I reference something you mentioned: word spreading so fast. I wondered if the Amish grapevine might make Amish suspense (eg a witness protection plot) a bit more difficult because everyone seems to know everyone else's business? My research suggests the Amish love to gossip! The Continuity sound great. Congratulations! Oh, and brilliant post Debby. Got carried away and forgot to say so! Thanks. Debby, there are a lot of details to consider when writing Amish suspense! I can't think of any other ways to get an Amish character from one place to another beyond what you've shared here. I know you've done your research, and it's reflected in your great stories! Jeanne, all stories present a challenge or two or three, don't they? Although often we don't realize the problems until we start writing. In my debut, the heroine's home was destroyed in a fire but I needed her to escape from the bad guys who had torched her house and flee with her son to a coastal island the next day. Both of them needed to take some personal items. I stewed over that problem. Eventually, I had my heroine pack her car for a short trip. Her house burned. She and her son got out alive and escaped to the coast in their already packed car. It worked, but I had to be creative. Now, I'm laughing! In another story, I had the heroine taking a casserole to a potluck dinner. That casserole had me pulling out my hair! How to get it in and out of the car, where to place it once she arrived at the house because a murder had taken place there. All this angst over that silly casserole. Crazy! I love your Amish books. I must admit I am behind in reading this series, but I bought the books so as soon as I can get to them I will. I am excited to know about the series with Dana Lynn and Maggie Black. We're getting snow today in the mountains. Praying that helps the vertigo to go away. I visited Pinecraft a few years ago. It was so fun and interesting to see the Amish. Snow here too Wilani, I Have Had Enough. The only good thing is I'm getting a lot of writing done. Not much of anything else, sigh. Thank you, Wilani, for your kind words about my stories! I'm excited about the continuity and love working with Maggie and Dana. Sorry about the snow. I hope it does help your vertigo. Change of barometric pressure? Is that what affects you? I wanted to go to Pinecraft this winter but my deadlines kept me at home and at my computer. After Easter, most of the Amish folks head north so I'll try to visit next year during their after-Christmas to Easter vacation period. What did you enjoy most about Pinecraft? Did you go with a tour hosted by Shelly Shephard Gray? I was there with Shelley Shephard Gray. I remember being shocked when I saw an Amish girl with a cellphone. I loved their tricycles. I hope you get to go next year. Yes, the change in barametric pressure is what effects it. Whenever there are tornado warnings and watches along with the storms, it is always worse then other times so I am entering the season when I will be affected. It has been bad for almost a week now. So glad the Lord is good. I'm sorry for your problems, Wilani. Vertigo must be terrible. Praying for you! Mega congrats, Debby, on the continuity series. That's so exciting. And while I don't see how you could possibly pull your short hair into a bun, I love the glimpse inside an Amish home. Oh, and I'll happily accept a slice of that apple pie. I can see how writing Amish suspense would be an exercise in growing as a writer with all of those constraints. And I love that you've taken on the challenge. Mindy, the bun is a problem, but then I'm making up stories so I pretend to have long hair. LOL!!! Every book presents its own challenges...or so it seems. Would you agree? Interesting post, Debby. You do such a good job weaving suspense, romance, and Amish together. Congrats on the continuity series. Figuring out how to make the Amish communicate without cell phones and other devices would be tricky. I have thought about how differently stories need to be constructed today when so many people do have cell phones. I think it is the opposite in some ways, because now we have to find a reason why someone would not be able to communicate when we expect them to have cell phones. I see that a lot in television shows when characters have to lose their phones, have their phones die, or not be able to receive cell service. When I watch older programs on TV before the cell phone days, I will notice so many plot lines that wouldn't work today because someone would have had a phone. Sandy, you're so right about the challenge cell phones present in contemporary suspense. It wasn't that long ago when characters didn't have cells. In one of my early books, my critique partners told me to add a cell phone. I'm low tech and always the last to get any type of new technology. I didn't have a phone so I didn't think my character needed one. LOL! Thankfully, I listened to my cps and added a phone. By the time the book published, I had a phone and I was glad my heroine did as well! Love this! It's so interesting to hear about how you craft a story within an Amish setting. And I love that you three are doing the continuity. How fun! Thanks, Beth. I find it interesting that there's always something within a story that I never think about before I begin to write, but later, it becomes a challenging stumbling block. Maybe the challenges are why I like to write...something to ponder! I think the challenges in life, although sometimes unwelcome, make us stronger, & are more meaningful in the end. Congratulations on the continuity, Debby. This blog article is so helpful to see some of the process of pulling not only romance and suspense into the story, but especially the weaving of faith in such an essential way for the plot. Crafting how to blend some of the modern world with the Old Order Amish way of life is always part of the intrigue for me with Amish romantic suspense. Love how you pack so much emotional character development into action-packed Amish suspense. Congratulations, again. Darlene, you're always so affirming. Thank you! Especially for your mention of "emotional character development." I try to do that...not sure I always hit the mark. I'm laughing, Darlene. Only in my imagination, right? Hi Debby - your books are wonderful! I have always wondered how authors who write Amish stories do it - so many different sects, traditions, ways of life. It seems it'd be hard to get it all correct. But you just outlined it all so perfectly. Thank you! I still believe I'll leave the Amish writing to you, but I will greatly enjoy what you write! Thank you so much, Cindy! As I was reading your comment and your mention of different sects, I thought of another challenge. The Pennsylvania Dutch language is spoken but not necessarily written so there are various spellings of the same words and differing phrases depending upon the Amish community. Keeping all those words and phrases consistent within a series can be a challenge. i LOVE that continuity series idea!! What fun! NEWS FLASH!!!! We have some villagers who made it into the finals for the Golden Heart, even without an inspirational category! Singing out for Laura Conner Kestner (double finalist!!!! )and Josee Telfer! LADIES!!!! Huge congrats to both of you! Happy dancing for you!!!! Such wonderful news, Ruthy! I haven't seen the announcement yet so thank you for letting us know. Congrats, Laura and Josee!!! So excited for both of you!!! Hey, if there's anyone on the finalists list whose name we don't recognize, let us know! We want to celebrate with you!!! Congrats to all the finalist! Such an honor and confirmation that you're doing everything right!!! I've baked a few apple pies this morning. They smell yummy! Would you like a slice? Congrats on new upcoming books. I love reading Amish ones. Hi Diana, thanks for being with us today! Tell us a little about yourself. Connie, thanks for pre-ordering the book! You're always such a dear friend and supporter! I hope you're feeling better. It seems you've had a hard winter! Ive not read any amish ones. But i love the military ones. Looking forward to reading the amish protectors. Hi Connie! I'm glad you like the military stories. Let me know what you think about the Amish series. A bit different, for sure, but still packed with suspense. Did you get a slice of pie? So awesome! I can't wait to read your new bpok!! Good morning Debby, what a great post to start my day here in rainy Truckee, CA. Snowstorm heading in tonight so I will stoke up the fire, and charge all of my tech so if the power goes out, I will be living Amish style. Loved your post and pictures. I so envy people that get to see that on a daily basis. No Amish anywhere near California. Your Continuity series is right up my alley and I can't wait for it to be released. Congratulations to all of you. Blessings for a wonderful day. Stay safe in the snowstorm! Praying your power stays on. When the weather turns bad and the power flutters on and off, I always wish we had a wood-burning stove. We do have a fireplace, but a stove would be so much better! My latest copy of The Budget, an Amish and Mennonite newspaper, mentions "plain" communities in Bangor, Modesto/Salida and Susanville, CA. Who knew? Maybe you can catch sight of a horse-drawn buggy if you head to those areas of California. Thanks for stopping by Seekerville today! Hugs! Thanks, Debby, for sharing a very informative post! This series sounds great. It would all be a challenge to me writing Amish suspense. Human trafficking is a topic I am learning more about. How did you deal with this in your series in relation to the Amish and self defense? I always think the hero--to be truly heroic--would have to protect the woman he loves in whatever way he can. Debby, just like having dangerous scene in a historical, the lack of technology is one of the things that make Amish stories good. Now days if someone's hurt, you call an ambulance. Bad guys are shooting at your house? Call the cops. Take away the phones and computers and things get interesting. Looking forward to the Amish Protector's series! Congrats on your continuity....sounds great and I hope to read it. I love the specific challenges that each genre brings, and how readers are so loyal to their genres! We have quite a few Amish here in SE Minnesota, and several of them are our customers. We're very familiar with the 'community phone' and other work-arounds for the Amish living in today's world. Erica, may I visit you? Pretty please? ANY TIME! :) We can do the rounds!!! I am in the final stages of writing "Te Amish Shop girl" to move the plot forward, since she is not yet a member of the district, I had her "bad boy" boyfriend buy her a prepaid phone. I try very hard to maintain Ordnung , but having created Barnville, PA it does allow me to decide just how strict bishop Yoder is going to be. Amos, so good seeing you here in Seekerville! Great idea to have the boyfriend buy her the phone. As I understand, the Amish teens love cell phones as much as our kids do! I doubt their parents allow use of them in the home. I recently saw pictures of Amish girls together at a diner and they were all on their phones. I love how diverse the Amish communities are. I've read a ton of Amish novels, suspense and otherwise, and I love being part of the different communities. When I first started reading Amish fiction I had preconceived ideas about what was right and wrong when it came to the Amish but now I realize there are tractor riding Amish in Oklahoma and one district in Ohio may allow bicycles while the neighbouring district will not. Fascinating -- and as long as the author is consistent with details I'm on board for a visit to any Amish community. Hi Kav, laughing about your desire for cell phones in WW II. So true. We start thinking they've always been around! In Holmes County, Ohio, the heart of the Ohio Amish country, there are 8 orders of Amish that range from the very conservative, Old Order Amish, to the less strict New Order Amish and then into the Mennonite communities, which allow their folks to own and drive cars. Each district has its own bishop and its own set of rules that, usually, the community decides upon when it first forms. You're so right. One group will ride bikes. Another will not. I've not actually read any Amish stories, though I do live in a state with a huge Amish community so I can see how difficult it would be to write Amish Suspense books. Do any Amish folks live near you, Nicki? I love to see the horse-drawn buggies. I love all the interesting tidbits you've discovered during your Amish research trips, Debby! Looking forward to catching up with your latest release, and congrats on the continuity! What a fun and inspiring essay! I am currently querying my first Amish novel and I hope I can have some measure of your success! Wishing you all the best with your writing, KS! I love your Amish mysteries. Can't wait to read your new one. Hi Debby, I am looking forward to your two new books and congratulations on the continuity. What a fun post today, Debby! You have a true talent for writing Amish Suspense, so I'm glad you've got more books coming out. :) For me personally, having my characters unable to use cell phones, computers, etc. would be a huge challenge, LOL! Congratulations on the continuity series! I miss you too, Patti Jo! Quite a challenge. I have nothing to add unfortunately. Glad you stopped by, Mary Preston! This was a wonderful article! I learned so much about your writing process and the road blocks you must navigate around to make the story authentic! Your PA Dutch breakfast sounds just like the ones we make here in PA. We do have a special name for our over easy eggs. We call them "dippy ecks". All the PA Dutch restaurants know exactly what you want when you order them! Patti, I've lived in PA, but I don't remember dippy ecks. A good phrase to know. Thanks!